Bubs struggled with night terrors for 75% of his life from 18 months of age to around six years of age. Praise God that it wasn’t every night but it seemed to hit in groups. He would be released from the horror for a while and then suddenly they would appear for several nights in a row. A night terror is a sleep disruption that seems similar to a nightmare, but with a far more dramatic presentation. A typical night terror started with him crying very loudly. He would not be awake but typically sat up in bed, sweating and thrashing around. As a parent, these were excruciating to watch because he was 100% inconsolable. My heart would beg God to allow me to hold him but I would surrender to the fact that most of the time touching him exasperated the issue. Below are a few tips that we learned along the away. 1) Days filled with lots of activity and many people almost always led to a night terror. This was the same for late nights. Holidays promised rough nights. I could peg terrors on days where his senses were overstimulated. It made me seem like a tyrant but I kept a tight hand on very energetic days. 2) Typically, the night terrors occurred after Bubs had been in bed, asleep for about 2-3 hours. As a toddler the episodes were more sporadic and happened throughout the night. 4) On the extremely bad terrors, we forced Bubs to drink some milk, literally holding a cup to his mouth. It wasn’t pretty but once we got him to start drinking the milk it would cause him to immediately calm down and go back to sleep. I have heard rumor that there is some medical explanation to this but don’t know the validity. 5) The terrors that caused Bubs to sit up in his bed tended to be much worse than the ones where he continued to lay down. We attempted to get him to lay down as soon as possible. 6) Unlike with nightmares, children do not remember night terrors. Bubs never knew they occurred. I received much comfort knowing this. 7) Many times we have simply sang “Jesus Loves Me” and prayed over him as he worked through the unknown. I won’t lie to you. I am very thankful that these days are in our rearview mirror. While they didn’t “hurt” Bubs, this mommas heart broke each time I heard that initial cry in the middle of the night. I can only pray that God will use our story to help others wade in the waters of night terrors. 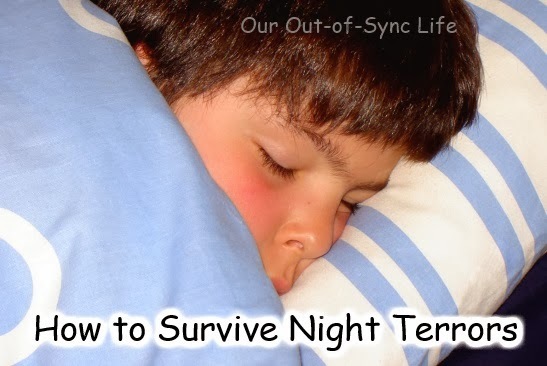 If your child has night terrors, I’d love to hear what you have learned. If you know of someone plagued by this issue, please love on them by sharing these ideas. THANK YOU for posting this article! My friend's 3 yr old has dealt with this for a long time now and has received some criticism it seems for being strict with potentially busy days and with his schedule. It was reassuring to her to know that there are others out there dealing with the same thing. Thank you so much for sharing this encouragement. I pray that your friend will find ideas to help her child.